Experience a vacation rental unlike any other in The Chapel Lofts at 221 Ashley Avenue! Our guests will have the option to reserve each suite individually or to reserve all suites at 221 Ashley (The Chapel, 221 Ashley B & C) which would accommodate a total of 32 guests. 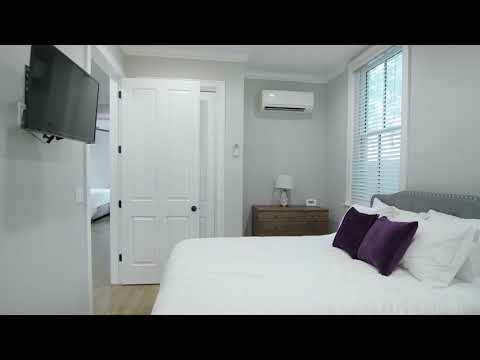 Suites B & C were completely renovated in September of 2018 to provide 2 additional 4-bedroom, 4-bathroom vacation rental suites on the property at 221 Ashley. Each bedroom has its own private bathroom. A vacation rental that is able to accommodate a family or group event of this size with 3 kitchens and 12 ½ bathrooms is something that you won’t find anywhere in downtown Charleston. The Chapel Lofts is the perfect venue for wedding parties, reunions, Charleston Affair weekend and graduation weekend! Each suite is equipped with wi-fi, HD televisions (living room and all bedrooms), a large private patio with seating areas, hot tub/spa, gas fire pit, outdoor kitchen and a guidebook to assist with finding local restaurants, activities and neighborhood groceries. The property includes 8 parking spaces – 3 spaces for Suite A (The Chapel), 3 spaces for Suite B and 2 spaces for Suite C.
The Chapel Loft suites are located conveniently to many neighborhood amenities. Numerous coffee shops, bakeries and restaurants are located within the direct neighborhood area and can be found in the Guest Guidebook provided in each suite. Also, The Chapel Loft suites are 1 block from Charlie’s Grocery, which has all of your basic needs and a great wine selection. Additionally, The Veggie Bin is located 2 blocks away.